This is a fun game for any party! 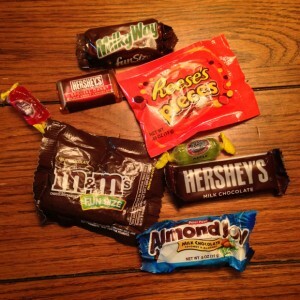 Start by putting pieces of candy on a table like M&M’s, Hershey Bars, Jolly Ranchers, Almond Joy, Milky Way, etc. Then group people into groups. I suggest grouping them into groups of 5 or 6. Then tell them to write a candy story using every single piece of candy you put on the table. One day a lady named M&M decided to visit her friend Hershey. Hershey suggested they go visit Jolly Rancher. “Sorry, Reese’s Pieces,” said M&M. “Where are you going?” asked Reese’s Pieces. “We are going to Jolly Rancher’s house,” said Hershey. “Can I come too,” asked Reese’s Pieces? “Of course you can; you are his best friend,” said M&M. When the three friend’s got there, Jolly Rancher was not happy, and they couldn’t cheer him up. So, Hershey suggested they go to Milky Way Pond. “Milky Way Pond is Jolly Rancher’s favorite place,” said Hershey. At Milky Way pond they had an Almond Joy of a time, especially Jolly Rancher. Thank you for reading my blog post please leave comments or questions below.